Student: I am easily distracted from the work I have to do. Teacher: What are you distracted by? Student: Stuff like the latest article about the Redstone update in Minecraft <that allows you to use the concept of electricity, pistons, electrical flow, breakers) or by the book that is screaming my name, or distracted by the story that I’m co-writing with my friend <the one I want to publish>, or by the new world I’m creating in Minecraft that allows collaborators to co-build and discuss in real time or by the new mode that I’m creating and why the Java Script isn’t working……. Teacher thinking: How can the distractions become the learning focus? Would this then eliminate the distraction? As a teacher of a special education classroom (Gifted Education), my prime directive is not to teach content, but to teach my students to recognize their own learning needs, to advocate and then to reflect on what works or doesn’t. It is to have them ask, ‘What do I need?” instead of “How can I meet your expectations”? It is my hope that these students can begin to see the difference between education and schooling and between teaching and learning. Ultimately, it is so that my students can drive their own learning and understand the structures that they need in place in order to be successful. With the concepts and examples of Flipped Classrooms, Khan Academies’ (and the like), Massively Online Open Courses (MOOC), and variety of online courses such as Harvard Open Online Courses or MIT Open Courseware, the structures and tools are available for learners to access whatever content they need in order to solve the problem or complete the project they have in front of them. Therefor, my role as teacher is clearly redefined. I showed my students the video, “If Students Designed their own Classrooms” and asked them to think about how this could relate to their own learning. I wondered how they conceptualized the concept of self-directed learning. Initially, they didn’t see a connection to themselves. Why would they? Students at this age still need structure, guidance and ongoing support and feedback. These students have been faced with teacher directed lessons, schedules, and goals. The concept of Inquiry (in the classroom) is somewhat foreign and like any skill or knowledge based lesson the students need scaffolding and monitoring each step of the way. A student of mine wrote the following piece. Alexander is a student that hasn’t had success (as he explains) with traditional teaching methods and has felt disengaged for much of his schooling. After watching the video he felt inspired (even optimistic) that, in some instances, our system can create learning environments that are based on choice, interest and passion and can be driven by the student. Alexander asked me to post his thoughts where others can hear his voice. Kids go to school to learn, right? To expand what they know? Then why do teachers decide what the students learn? What if they already know it? What if they are ahead, or behind? The student will know that better than the teacher. They know what they know. They know how to most easily do it. The student knows how they learn. So let them learn that way. Let the student choose how to learn, and what to learn, because THEY KNOW. Each needs to learn their own thing, their own way. Each needs different work, and, sometimes, special attention. So let them learn. School is a learning environment, not a teaching one. How would an adult answer a tough question? Look it up. So let kids do that too if they want. Let them do projects, or paragraphs, or a diorama, or even a model in Minecraft! If they want to do it, then they probably do it better that way. If they say that they know that already, then teach them something new! A teacher’s role should be to help learning, not to tell kids to do something. I skipped science today because we had to do stuff on circuits that I knew in grade two!!! I came to school to learn, and I wasn’t learning anything except how to be bored, which I learned enough of in grades two to five (in grade one it was still mostly games). As I said, people come to school to learn. SO LET THEM. RELATIONSHIP – In order to implement this approach of teaching there has to be a significant understanding of who the student is as a learner. We take a significant amount of time reflecting on how to communicate what we know, how to reflect on how we know it, and how to synthesize what is next. BLENDED LEARNING – Each day, I provide individual tasks via Edmodo or Google Docs. Students will either choose a goal or be assigned one to work on. 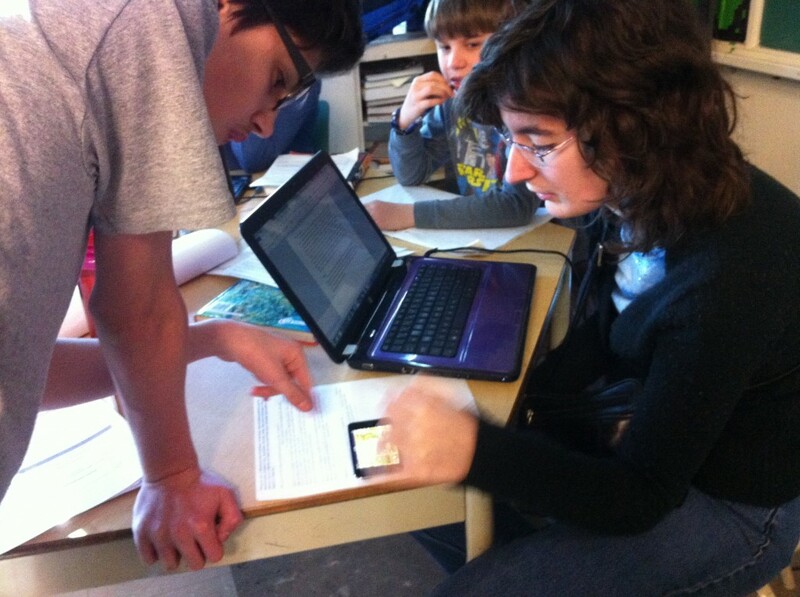 The Blended Learning structure allows students to access his/her individual plans and to communicate with teacher. It also allows for parents to be involved. Uploading plans and activities ahead of time has also been effective! TOOLS – I try to provide time for students to explore and learn how to navigate the tools (ie: Khan Academy, Math apps) and let them pick out the activity or app that interests them to share with the class. The “Resources” section in the classroom is important. TIME – Provide enough time to allow students to work on a given task. It often takes them 10 minutes to get going on a task. This time for “small chat” is important – like it is for adult learners. FEEDBACK – Ensure students aren’t just ‘doing the work’ but that there is a purpose. Give feedback to each group, or individual. I find myself walking around the room, prompting, checking, and reassuring. DIFFERENTIATION – Allow students to use the tools or apps they want rather than assigning. Some may use Educreations, while others are using the Livescribe. 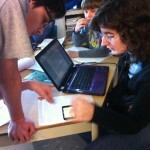 The marker and chart method works too, although the students always upload what they’ve done to Edmodo or Evernote. INDIVIDUAL EDUCATION PLANS – I print out their IEP’s and allow them do fill it in or comment/edit what I have already done. This is significant in helping them recognize that they have a VOICE. We do this several times a year and then hang them up on clipboards. This entry was posted in 21st Century Literacies, Gifted Classroom, inquiry based learning, learning2030, Student Engagement and tagged 21st century Learning, engagement, gifted, learning2030, minecraft, self-directed learning, student engagement. Bookmark the permalink.